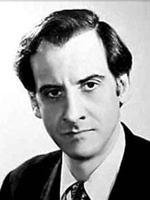 Hans Conried studied acting at Columbia University. He was a member of Orson Welles' Mercury Theater troupe and had roles on on My Friend Irma and the Edgar Bergen-Charlie McCarthy Show. 09/16/1975 0345 The Prison of Glass In order to escape the emotional baggage in her life, a talented but troubled actress dreams of being able to seek refuge in a glass snow globe she has an unusual fixation with. 03/25/1976 0455 The Transformation of Joebee Confessing to a last prank is seems to be too good to be true, when a perennial joker announces he has mended his ways. Could this be true or is it perhaps the biggest hoax of the century? 02/21/1977 0604 Orient Express An estranged couple chance upon an unlikely reunion aboard the legendary Orient Express en route to Czechoslovakia. In this tale of international intrigue set during the Cold War, a shrewd reporter and sassy lounge singer become entangled in a web of lies and they must work together to uncover the truth. 03/03/1977 0610 The Overcoat In post-revolutionary Russia, a man devotes his entire savings to purchasing a new coat to satisfy his boss. The rest of his life's problems are related to that coat. 06/13/1977 0664 First Woman in Space The first woman in space returns to earth with an alien living within her --- an alien that will fight her for control of her body and survival in her new environment. He was in six episodes of CBSRMT. Conried was a veteran voice actor form radio and film and guest appeared in dozens of television shows. My first exposure to him was his role as the voice of Cpt. Hook in Disney's animation of Peter Pan.